Some of the bones from the cave in South Africa. Image by John Hawks who is one of the co-authors of the paper describing these bones. I correctly predicted that Ken Ham and Answers in Genesis would proclaim these fossils to be “nothing but one of the variations that developed among apes,” but I was wrong in my assumption that other YEC organizations would fall in line behind the Answers in Genesis proclamation. Below is a chart that summarizes the positions that YEC organizations and individuals took in the days and months after the initial discovery was revealed to the public. Institute for Creation Research: Imaginary creatures resulting from a mixture of human and ape bones. Each of these groups has exactly the same information available to them and yet their interpretations are in direct opposition to each other. How might we account for these differences? All of these YEC groups or individuals approach the fossils with one unfailing assumption: that the fossils must represent either fully ape or fully human individuals. Their task then is to simply assign the bones either being a descendant of Adam and Eve or just another type of animal. For some hominid fossils this task may be challenging because only a few bones may exist but the Homo naledi fossils include over 2000 bone fragments representing nearly every bone of the human body and dozens of individuals including children, young adults and adults. The bones are also found in a very unusual position which also provides data which can be used to draw conclusions about the origin of the bones. Given their assumption that common ancestry of humans with any other animals is possible, we should expect that given such a large data the status of the fossils should be readily identified as human or not. 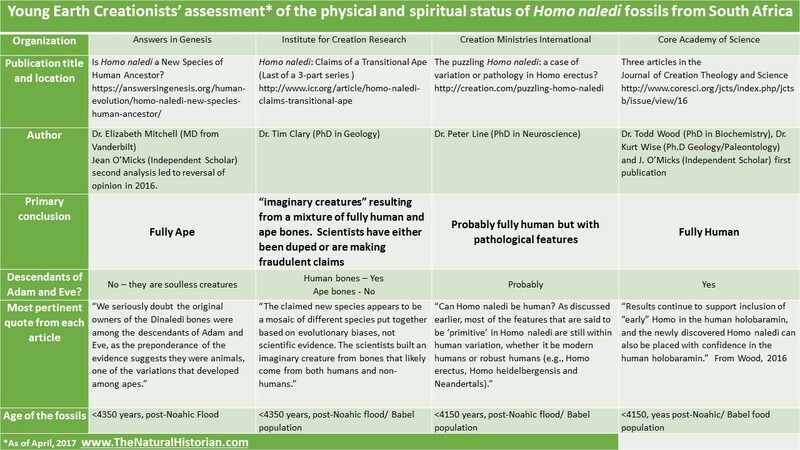 The conclusions that YECs draw about the human status of hominid fossils partly reflect their diverse understanding of how science works and how trustworthy the scientists are who collected the data. For example, when ICR suggests that the bones are a mixture of human and ape bones, they are asking us to believe that the scientists have either purposely or incompetently misidentified bones from two sources and ascribed them to a single skeleton. It also reflects their own ability – or lack of ability – to assess complicated data sets and certainly involves their own, apparently differing, views of what physical features make a human a human. Each organization has ended up emphasizing different characteristics. Furthermore, they have interpretations with respect to the context in which the bones were found which lead them to different conclusions about the physical and spiritual status of these individuals. For example, for Answers in Genesis, cultural symbols weigh heavily in their decision making process. They always point out the lack of artifacts found with the bones as evidence they are apes because the lack “human-like” behavior. CMI appears to have taken what I initially predicted would be a safer route. That safer route includes claiming they are human because it is far more likely that new discoveries, such as artifacts in the cave, will humanize these fossils overtime. As a result, CMI will be able to accommodate nearly any future findings into their interpretive framework, whereas AiG is going to find new data much more difficult to accommodate with their approach toward these fossils. 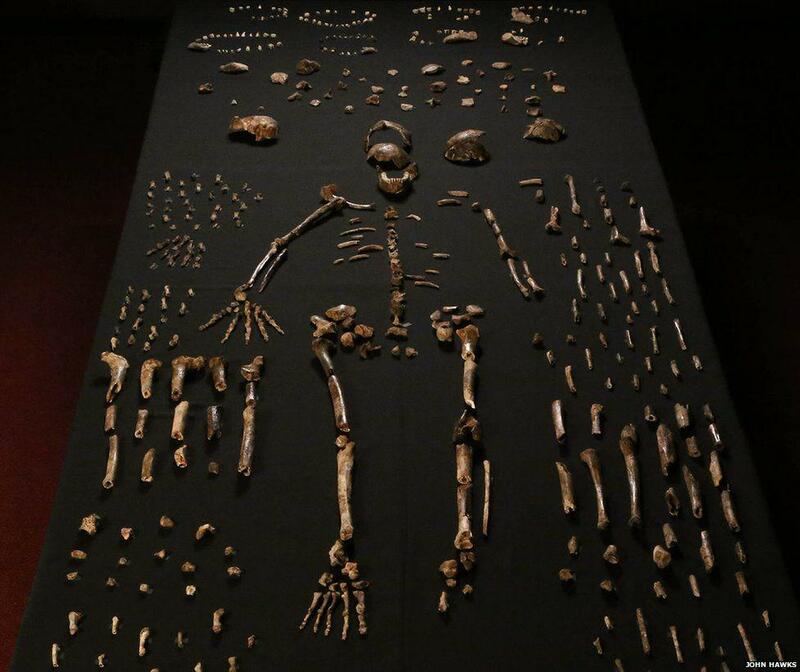 How do YEC organizations view Homo naledi now? Short answer: Nothing has changed. Two years after Homo naledi was introduced to the world and YECs made their first assessments, we can now look back and see how young-earth creationists have responded and continue to respond to new revelations about H. naledi. A whole batch of new data was recently published which has prompted scientists to re-evaluate the fossils in light of the new data. The most important new finding is that multiple individuals, including a relatively complete young child, have been found in a second chamber. The bones of these individuals are so similar to those from the first chamber it is almost certain that they represent individuals of the same species and probably the same population. With more bones from the same group, the mystery of who these individuals were and how they came to be stashed in remote portions of a large cave system becomes even more fascinating. Let’s look at the recent responses by YECs to these new discoveries. Answer in Genesis: The response from Answers in Genesis to the most recent revelations about Homo naledi has been to literally laugh off the new reports as if nothing new was learned. You can see some of their responses in their Answers Newscast on FB live HERE (around the 7 minute mark). In that video we learn that in the fossil record “we find apes or we find humans,” and if you look at the skulls of these fossils “it’s so obvious” which are human. Dr. Purdom mentions a few characteristics of the fossils that are ape-like and she mentions the lack of artifacts found with the bones. The bottom line is that members of AiG sound very confident these bones are nothing but some poor apes that lost their way in a cave. But as we have seen, the other creationist organizations don’t find it so obvious that these are just apes. If individuals assigned to Homo naledi are cretins, then it makes more sense that they come from robust human populations, such as Homo erectus, because of their greater similarity in skeletal features to the latter than to modern humans. One explanation why robust humans (such as Homo erectus, Homo heidelbergensis and Neanderthals) were more robust (heavily built) and/or different in morphology to modern humans is that this could reflect differences in development of these pre-Flood and early post-Flood humans, linked to longevity. So CMI is doubling down on their assessment that Homo naledi are descendants of Adam and Eve, and even more recently descendants of Noah, and thus fully human. To support this conclusion they propose that some of the bones look so much like apes because this population of humans suffered from a number of pathological conditions. So why does CMI not agree with AiG? What they observe is that there are many bones that are more human-like than ape-like and they weigh the similarities more heavily than the differences whereas AiG emphasizes the differences. In addition, they are also swayed by the context in which the bones were found. That context suggests the bones could have been placed there as part of a burial ritual. Burial would be a very human activity, and thus they conclude the bones must be the remains of a descendant of Adam and Eve. If the bones belong to recent humans, then all the ape-like parts of their skeletons need to be resolved and cretinism or other pathologies become the tool to provide that resolution. Institute for Creation Research: Remember that their initial response was that the fossil find was a mixture of human and ape bones. They came to that conclusion because, in their estimation, the bones themselves included some that were too human-like to deny their humanness but there were other bones that were too ape-like to deny ape ancestry. So they chose to ignore the context in which the fossils were found and didn’t trust the reconstruction of the skeletons presented in the papers. So far there has been no formal response from this organization; however, I have tracked their Facebook feed and comments, and the passing comments would suggest that they are not inclined to change their opinion. I should note here that Todd Wood has been critical of the hyper-skeptical stance taken by ICR. He rightly points out (Homo naledi is not a mix of two species) that the latest discovery of a second chamber with bones that are nearly indistinguishable to the first set and the fact that many of the bones are found together means that there really is no chance that the researchers have accidentally combined human and ape bones in their reconstructions. I wonder if ICR will reconsider their position or simply never respond to these latest findings. He surmised that the fossils must date from after the dispersion of the people from Babel because the remains were found in South Africa, which he says is a very long way from wherever Babel was located. Summary: For now, each YEC group seems to be holding to their initial opinions about the human status of Homo naledi. This continued disagreement is nothing new with respect to human fossils. The status of hominid bones has long been contentious among creationists. This is surprising given their insistence in talks that there is a wide genetic and morphological gulf between humans and apes. Oddly enough there is one strange set of fossils from a small Indonesian island that all YECs agree were human despite being as much a mosaic as Homo naledi. Those are the fossils referred to as the “hobbit” or Homo florensiensis. We will compare the response of YECs to the hobbit and the H. naledi fossils in the near future. « Reflections on “Is Genesis History?” Part II: Where do the Lines of Evidence Lead? OK, so I’m curious. If ICR think that the bones are a mixture of ape and human, how do they deal with the fact that it’s always the same bones that are human-like or ape-like? I don’t think they looked close enough at the data to even realize or think about the fact there are multiple individuals in the cave. Until you mentioned it, your point is so obvious I had missed that as well. Where is the tibia from the ape if there are 5 human ones? Great question. Not to mention individual bones that bear mixed or all-together different characteristics.,,like skulls. Dr. Line’s theory that these fossils represent a population of humans all suffering from cretinism (alias: congenital hypothyroidism) seems unlikely. The most plausible mechanism would be iodine deficiency due to low soil content but according to the World Health Organization (WHO) the area where the fossils were found has never been an iodine poor region. So for this to work Homo naledi would have to be eating a more iodine poor diet than the majority of people living there today. The symptoms of congenital hypothyroidism include short limbs, poor muscle mass, poor coordination, mental retardation, and infertility. There are degrees of severity but if growth is being significantly affected the other symptoms are would be expected to a similar degree. How a population of individuals with these characteristics could survive in a predator rich environment needs to be explained for this theory to be viable. If and when they manage to find enough preserved DNA for testing, that should settle the matter that these are not merely malnourished Homo sapiens. In the meantime, we should ask the creationists why a hoard of human corpses interred within the past four thousand years would pose such difficulties in recovering DNA. Why shouldn’t “post-Babel” Naledi’s Carbon-14 measure as much as pre-pyramid Egyptians – or does secular science just assume that the bones are too old to provide C-14 data? Exactly! We have thousands of 3 to 5 thousand year old human bones and when we date them with C14 we get ages that fit very well with our expectations. Why then does the Hobbit fossil, neandethals, naledi, etc.. all have a different C14 profile? This isn’t asked of YECs enough. This is interesting, why is it that evolutionists disagree with one another on a whole array of questions, yet point the finger of blame of inconsistency at creationists? The bloggers here did not realize that Wood’s and O’Micks’s original analyses only took craniodental characters into consideration. O’Micks did further analyses on postcranial data, and changed his views accordingly (therefore it is a false claim that creationists are dogmatic and don’t change their views based on evidence but the bloggers blithely forget to point this out). Craniodental data can vary a lot. So, this blog is religiously biased against creationists, but I’m not surprised. The point is that simplistic YECs like Ham like to say its obvious what a human is and what is not. No anatomist would have difficulty determining that a skull of any human alive today is human so it is easy to tell the difference. But the why should the cranial features of this fossil be so difficult to determine if there it is “easy to tell the differences?” I am fully aware of O’micks analysis and and that he has revised his view based on additional features. Religiously biased against creationists? Definitely fake news.